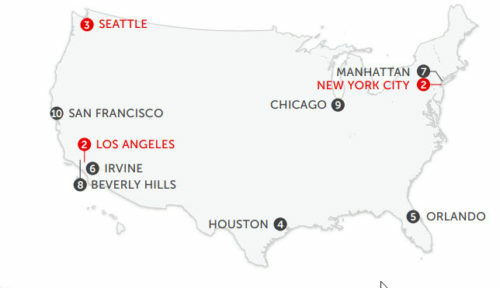 The top 10 locations Chinese Buyers picked 2017 included the cities of Houston, Orlando, and Beverly Hills which steadily rose in ranks last year, even as 2017 welcomed two newcomers to the list – Manhattan and Chicago. With the fate of the EB-5 visa scheme still uncertain, as well as recent tensions over trade between the two countries, how will Chinese buyer interest in the US fare in 2018? While it’s early days yet, we perceive that the Chinese demand for US real estate is likely to be sustained into the new year, seeing as the US is a ‘near-perfect’ market for Chinese, thanks to myriad factors such as its top-notched education and strong growth prospects. Sitting comfortably at #2, the Chinese love for Australia went unrefuted last year. According to Credit Suisse, Chinese residential property investors were estimated to account for close to 80% of total foreign demand in Australia, and purportedly own 25% of new homes sold in New South Wales (NSW), 17% in Victoria, and 8% in Queensland.3 Furthermore, Credit Suisse analysts projects that Chinese residential property investment is still set to grow in Australia. That’s a surprising outlook, considering Chinese property buyers are now faced with stricter lending restrictions, and a ban on foreign property buyers owning existing properties by Australia’s Foreign Investment Review Board (FIRB). Let’s also not forget the foreign buyer taxes ranging from 3%-8%, as well as a ‘ghost tax’ – a new annual vacancy tax on unoccupied residences owned by foreign homeowners4 – in certain states of Australia. 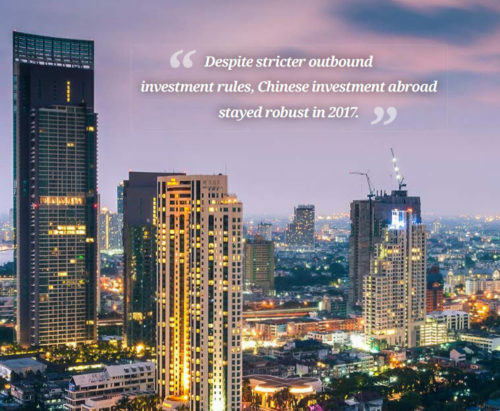 Experts at Swiss-based global financial services company UBS, however, have cast a more pragmatic projection that Chinese property buying in Australia may slowly ease oŠ in 2018, particularly as Australia’s strong house prices may propel price-sensitive Chinese investors to look for other emerging investment destinations offering enticing prospects, such as Bangkok in Thailand.5 Where were mainland buyers looking in Australia last year, though? Interestingly, the top cities drawing Chinese buyer attention have stayed fairly the same as the 2016 ranking, with Melbourne once again dominating as the most-viewed Australian city on Juwai.com for Chinese property investors, followed by Sydney and Brisbane to round up the top three. 2017 was the year that Asian cities shone, as real estate buyers from China increasingly sought alternative locations with more affordable prices as well as stronger prospects and yields. With Thailand being the third-most popular investment destination for Chinese property buyers, it was no shocker to see that half of the top 10 most-eyed Asian destinations on Juwai came from there – Pattaya (#1), Phuket (#2), Bangkok (#6), Chiang Mai (#7), and Ko Samui (#10). Moving forward into 2018, with China pushing its One Belt, One Road (OBOR) initiative, Asian cities along the OBOR route could stand to reap much benefits from increased Chinese investor interest in the new year. Already, Chinese enquiries on Juwai.com grew 114% for Thailand, 64% for Malaysia, and 43% for Hong Kong in 2017 , which could possibly bode well for the next 12 months. 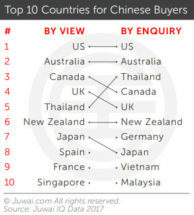 Although Thailand overtook Canada in terms of popularity, Canada remained well-loved by Chinese property investors last year, so much so that even foreign buyer taxes were no deterrent for them – Chinese buyer interest in Canadian property grew 30% y-o-y in H1 2017 on Juwai.com. While some Chinese buyers gravitated towards the US – especially nearby Seattle – Chinese demand for Canada held steady over the past 12 months, likely thanks to its top-notched education and lifestyle appeal. Interestingly, despite the fact that Ontario followed the footsteps of British Columbia (B.C.) to impose a 15% foreign buyer tax last year, Toronto was still the most popularly-viewed Canadian location in 2017 for homebuyers from China. Likewise, Vancouver remained as the second-most viewed hotspot in Canada, followed by Montreal, Calgary, and Ottawa – all whose position remained steady and unchanged from 2016. Would these rankings shift in 2018? Only time will tell. However, a new national mortgage stress test 6 – combined with an increased key interest rate to 1.25%7 – could mean for interesting times ahead for Canada’s housing market. This includes some of China’s largest real estate developers, such as Country Garden, who aims to develop new towns in London and the commuter belt similar to the $100-billion Forest City project in Malaysia.10, 11 Another big player in the UK to note is R&F Properties, who acquired Vauxhall Square – a mixed-use development in Nine Elms – as well as Nestlé Tower in Croydon plus its surrounding development sites, which already has development proposals for over 1,000 residential units.10 Looking ahead, it would seem that many Chinese commercial property investors have stayed relatively unfazed by the UK’s impending departure from the European Union (EU). According to a survey in November 2017 by Ipsos MORI, 58% of the 81 Chinese companies surveyed disclosed that they were ‘more likely to invest in the UK over the next five years’, compared to 55% of German investors and 52% of French investors who polled the opposite, saying they were ‘less likely to invest into the UK’ due to Brexit.12 Would this spill over to Chinese residential property investment in the UK this year? While nothing is set in stone, chances are high that this could happen, especially in alternative investment locations like Tier-2 cities that are more affordable and over higher yields and prospects. 2016 was a big year for New Zealand, which saw Chinese buyer interest surge 50% on Juwai.com, and it seemed as though the momentum would somewhat tide over to 2017, particularly as the Australian government’s decision to tighten rules on offshore buyers had Chinese buyers switching over to consider neighboring New Zealand instead. With possible trade war talks going on, I wonder if the United States will be as high in demand in a 2018 list compared to the Top 10 locations Chinese Buyers picked 2017 list. To top it off, the Kiwi government also launched a brand-new five-year multiple-entry visa for Chinese visitors midway through last year as well, which saw Chinese arrivals on the uptick from July 2017 onwards.13 As the September 2017 New Zealand general election neared, however, investment dipped as some Chinese buyers chose to hold back on their investments while awaiting the election outcome, which subsequently gave rise to one of the biggest shockers of 2017 when newly-elected Prime Minister Jacinda Ardern announced in late October her intentions to implement a foreign buyer ban in early 2018.14 This led to a 35% m-o-m increase in enquiries from China buyers on Juwai.com in December 201715, as United Kingdom Chinese buyers rushed to snap up Kiwi homes before the new legislation comes into effect. Nevertheless, how this would continue to play out in 2018 remains uncertain once the new ruling is successfully implemented, seeing as foreigners will still be allowed to purchase land and develop housing on it to sell. The Euro has stayed weak against the Chinese yuan, and this has helped Europe remain a point of interest for Chinese buyers. Germany, in particular, saw an upsurge in Chinese buyer enquiries that went up 26% on Juwai.com to become the 7th most enquired country by Chinese investors in 2017, while Berlin jumped up one spot to be the second-most viewed location in Europe.1 With this year being the 2018 EU-China Tourism Year, we foresee Chinese property buyer interest in Europe to burgeon, seeing as Chinese investment plans are often linked with their travel plans.17 Already, Chinese travelers to Europe grew 26.3% y-o-y to reach 6 million in 2017, according to a latest report from China Tourism Academy (CTA) and China’s leading online travel agency Ctrip, and this number is expected to keep rising in 2018.17, 19 Where will Chinese buyers head to in Europe this year, though? While there’s no crystal ball when it comes to the Chinese market, we think Greece has the potential to be a hotspot for Chinese in 2018, particularly as property prices have declined even more than the 25% contraction in the Greek economy since its 2008 sovereign debt crisis.20 Already, Chinese buyer enquiries for Greek properties grew 83% y-o-y on Juwai.com1 last year, and late 2017 saw an uptick in Chinese buyers honing in onto Greece to capitalize on the low prices and future capital gains in its real estate market, as well as the online foreclosure auctions by Greek banks.20 The Greek Golden Visa program also grew 40% y-o-y the year before, with China being the largest group of foreign property investors in Greece via its Golden Visa scheme. In fact, China accounted for 43.55% of all 2,170 Golden Visas issued in 2017 – 945 residence permits went to buyers from China, compared to Russia (387) and Turkey (191).21 Furthermore, Greece is also set to become one of the key points of China’s ‘One Belt, One Road’ (OBOR) initiative22, and most recently, the Industrial and Commercial Bank of China (ICBC) – the largest bank in the world – has o²cially applied to enter the Greece.23 All these adds up to make Greece worth keeping an eye on in the next 12 months.